The vibrant greens, blues and violets used in the colour scheme of the rooms are eye-catching. 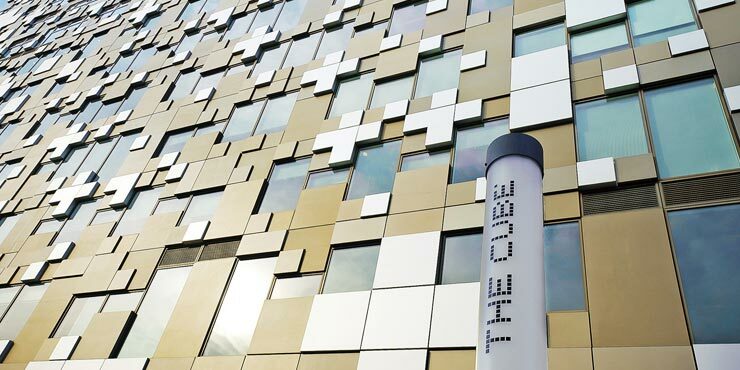 Hotel Indigo is located on the 23rd and 24th floors of the spectacular building complex “The Cube”, which has an extravagant façade consisting of 8 250 natural and bronze-coloured cubic aluminium panels. For the cladding of the building envelope, a total of 18 000 m² of façade material made from specially anodised aluminium has been used, which has been completely installed from inside the building without any external scaffolding.